The Bruce Vento Nature Sanctuary is a city park located in the Mississippi River corridor in Saint Paul, Minnesota, United States. Situated just east of the city’s downtown district, the sanctuary includes towering limestone and sandstone bluffs, spring-fed wetlands, abundant bird life and dramatic views of the downtown Saint Paul skyline and Mississippi River. The sanctuary possesses a rich ecological and human history. Once a floodplain where Phalen Creek and Trout Brook flowed together into the Mississippi River, the land was used and valued by Native people for thousands of years. The site is home to Wakan Tipi (Spirit House), a Dakota sacred site commonly known as Carver’s Cave. The North Star Brewery was built into the bluff in 1853 and later became Jacob Schmidt's first brewery. In the 1880s the land was claimed for industrial use and became a busy rail yard. Abandoned in the 1970s, the 27 acres (110,000 m square) of the land were purchased through a broad partnership, and became a Saint Paul park in 2005. An additional 1.85 acres (7,500 m square) of adjacent industrial land were purchased and added to the park in 2008. 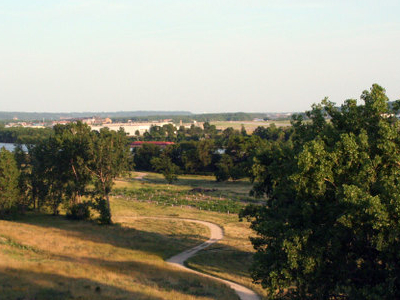 The sanctuary’s floodplain forests, oak woodlands, prairies and other native ecosystems are being carefully restored and the park has gained state and national recognition for its combination of ecological and cultural resources and for the community involvement in its transformation.Future efforts include achieving a direct pedestrian/bicycle trail connection to the Mississippi River and redeveloping the land adjacent to the sanctuary for an interpretive center and other park-related use. Here's the our members favorite photos of "City Parks in Saint Paul". Upload your photo of Bruce Vento Nature Sanctuary!